I cannot imagine treating any patient without assessing posture, or, more precisely, alignment. When the patient with low back pain has a flat back, the emphasis of my treatment is different than when the patient has an excessive lumbar lordosis. I will also expect that the contributing muscle impairments will be different in these two patients. The ideal posture is reached by aligning the body through an imaginary vertical line passing from the center of the ear down through the neck (cervical vertebrae), the tip of the shoulder, then dividing the rib cage in half, down through the center of the lumbar vertebrae, then slightly behind the hip joint, slightly in front of the knee joint, to end slightly in front of the lateral malleolus (outside ankle bone). In this ideal posture, the head is in neutral position, not tilted forward nor backward, and the ribcage allows for efficiency breathing . 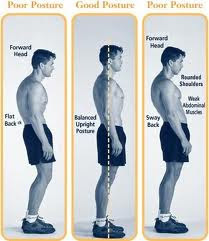 A comprehensive postural assessment consists of three essential components: examination of body alignment in standing (static and dynamic postures, assessment of bony architecture, and alignment of the upper and lower quadrants for deviations from ideal posture), tests for joint flexibility and muscle length, and tests for muscle strength. Although there can be a combination of the three types of posture in one, the main postures are kyphosis-lordosis, swayback, and flatback. The first one is a common posture where the head is forward and the upper back is excessively round; the neck flexors are generally weak and the neck extensors are short and tight; the muscles in the chest are tightened with forward, rounded shoulders (pectorals) and the upper back muscles are lengthened and weak. The pelvis is often rotated forward, with excessive curvature in the lumbar (low) spine; the muscles in the low back and hip flexors are shortened; the abdominal and gluteal muscles are weak and the hamstrings are stretched.